ROCHESTER, NY--(Marketwired - Nov 29, 2017) - Sleigh bells ring, are you listening? It's the most wonderful time of the year in Upstate New York, and there are plenty of reasons to play in the snow. Stop by the Genesee County Village and Museum for Yuletide in the Country Tours where you can experience an 1849 Christmas event like no other. Journey through the snowy Historic Village as you visit the homes and businesses of the villagers - they are celebrating the news that Christmas has been declared an official holiday in New York! Or warm your toes at the George Eastman Museum Sweet Creations Gingerbread House Display. 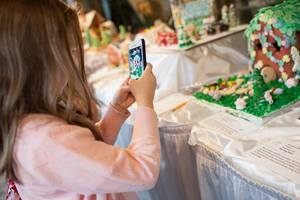 This annual display features dozens of cleverly designed and deliciously decorated gingerbread houses and objects. Bring your camera to capture the creations - it is the world's oldest museum dedicated to photography, after all. From horse-drawn carriage rides and a glassy winter wonderland, to a train ride that transports you straight to the North Pole, there's something for everyone in Upstate New York this December. So, lace up your winter boots and head across the border where winter fun abounds. Every Saturday until December 23rd, eat, mix and mingle with old Kris Kringle, Mrs. Claus and their closest friends! Parents are encouraged to bring their cameras to take photos of those candid Christmas moments with the little ones. And don't forget to check the calendar before you go - there are plenty of special events happening every weekend at the Turning Stone Resort & Casino. Celebrate the season of sparkle and shine with an abundance of holiday-related activities and offerings at The Corning Museum of Glass. From Make Your Own Glass experiences to the Glittering Holiday Tree, glass demos, galleries, and exhibits to explore, the holidays are always glittering and bright at the museum. Celebrate the holiday season with a visit to Fountain Elms at Munson Williams Proctor Arts Institute. The dining room, parlor, bedroom, and library period room settings showcase Christmas traditions introduced to Utica, NY by immigrants from the British Isles, Germany, Poland, and Italy. The Victorian Yuletide exhibition highlights different days throughout the Christmastide season observed by each of these groups, allowing visitors a historical look into Christmas' past. Ice Fest is an annual tradition in Downtown Ithaca. No holiday season would be complete without a celebration of cold weather and cold weather sports, like Ice Carving*! The festival features impressive display sculptures, fire demonstrations, the ever-popular Ice Bar: an outdoor bar made entirely of ice that serves beer, wine, and hot cocoa, and a tasty Chowder Cook-off. Three days of events, means three different ways to enjoy the celebration! *The Ithaca Ice Festival ice carving competition is a National Ice Carving Association sanctioned event. Experience the magic of the Polar Express! Enjoy a one-hour ride filled with music, hot cocoa, story time and Santa, who will give a magical Christmas bell to each child on board. Museum admission is included in your ticket fare, and pajamas are encouraged! Rides depart from the station throughout the day. At 2300° Fahrenheit, hot glass gets interesting--and so do things at The Corning Museum of Glass. Enjoy glassmaking demonstrations by Nisha Bansil, live music by "the baddest band in the land" The Weber Brothers, and great food and drink. Free and open to the public. Visit the Lake Erie wineries over the Holiday break. Got cabin fever? A wine tour provides a perfect outing for guests and relatives. Each winery will have special offers and deals, and no tickets or reservations are necessary. Enjoy a winter wonderland as you travel by horse drawn sleigh along a scenic, private road, passing beautiful Woods Lake midway. The adventure lasts approximately 30 minutes, so be sure to bundle up! Ring in 2018 with your special someone at the Inn at Glenora Wine Cellars. The New Year's Eve package includes a romantic and relaxing celebration, with additional add-ons available to make it extra special: overnight stay includes a bottle of Glenora Brut and champagne flutes, chocolate covered strawberries, a welcome reception at Veraisons Restaurant, and a breakfast buffet and late check-out on New Year's Day. Let the beautiful view of Seneca Lake be the first you see in 2018! Pack your bags and plan your trip! More discounts and deals can be found online at www.crossbordershowcase.com. The Cross Border Showcase travel program encourages and entices Canadian visitors to explore deeper into New York State. The program showcases a unique collection of attractions and experiences that are all comfortably within driving distance from the Canadian border - beginning in Western New York, Rochester and the Finger Lakes region to well into Central and Northern New York. The program's partners include accommodations, shopping destinations, family and four-season recreational activities, communities and tourist-friendly businesses. Many of the partners offer discounts for Canadian visitors. Current offers, information and destinations can be found at www.CrossBorderShowcase.com and by following the program's Twitter or Facebook.